Looking for a sweeter smelling nursery? Look no further than Diaper Genie Complete Diaper Pail with the Ultimate Odor Lock system, now fully assembled. This Diaper Genie Complete Diaper Pail is ready to go to work, straight out of the box. 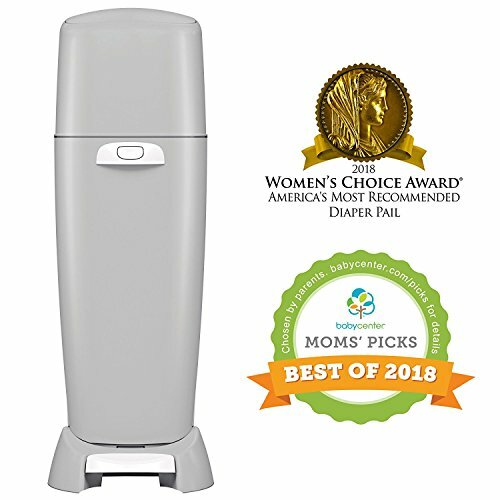 The Diaper Genie Complete Fully Assembled Diaper Pail features a 7-layer refill bag, Air-Tite clamp, and front tilt for easy empty bin experience. Built-in activated carbon filters-the simple, effective way to help keep your nursery fresh, helps to absorb and lock in strong diaper odors. Our design makes dirty diaper disposal quick and easy and prevents odor unlike an ordinary pail and plastic bag. In fact, the Diaper Genie Diaper Pails are the #1 selling diaper pail brand. If you have any questions about this product by Diaper Genie, contact us by completing and submitting the form below. If you are looking for a specif part number, please include it with your message. Child Cabinet Locks | Invisible Design Baby Proof Safety Latches for Cabinets | Easy Adhesive (3M) NO Tools Needed No Drilling Closet and Drawer Locks | 12 Pack!